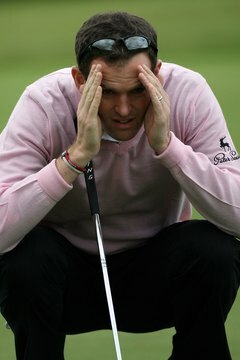 Golf requires intense concentration, especially while on the putting surface. The mental aspect of golf is a critical element of playing well. Mental errors, as much as poor swing technique, often cause high scores. A golfer must train his mind as well as his muscles to play up to his potential. Playing good golf requires intense concentration and complete focus for brief periods, beginning with planning your shot and selecting the club. Learn to put non-golf-related thoughts out of your mind as you prepare to swing. Don’t let day-to-day concerns about your job or other aspects of your life disrupt your concentration when you get ready to play a shot. Focus also requires playing your own game and not being affected by your playing partners. If you hit shorter drives than they do, don’t press or overswing in an attempt to match their distance. After your round, go over your scorecard and recall your best shots for the day. Give yourself a mental pat on the back for the holes where you really played well. Learn to quickly put bad shots behind you. When a quarterback in pro football throws an interception, he has already forgotten about it by the time he gets back on the field for the next series. In golf, brooding over errors takes your concentration away from what you should be focusing on--your next shot. All golfers feel anxiety at times during a round. But golfers who don’t play frequently often experience an acute case of nerves. This causes mistakes such as swinging too fast, not completing the backswing or rushing down from the top of the swing. Accept the fact you may feel anxious--that it’s a normal reaction and your playing partners probably are experiencing it as well. Try to slow everything down. Take the club out of the bag more slowly. Take a more leisurely practice swing than usual. Deep breathing can help you relax as well. Playing strategically means hitting shots that have the highest percentage of success. If you tend to hook the ball off the tee with the driver, when you encounter a hole with a lake or other severe hazard on the left, select another club such as a 4-wood or 3-iron. Sacrificing a modest amount of distance is much better than having to tee another ball up and take a penalty stroke because you hooked the ball into the lake. Jack Nicklaus, in his book “My Golden Lessons,” suggests that if you see trouble on one side of the hole, such as a lake or trees, tee the ball on that side of the tee box so visually you are hitting away from trouble. Players with outstanding short games such as Tiger Woods and Phil Mickelson are often credited as having great “imagination” around the greens. They are able to visualize the perfect shot in a given situation. Visualization is important on every shot. You imagine the flight of the ball from the instant it leaves the club head, see how it curves in the air, and envision the final result--the ball landing in the middle of the fairway or close to the flag stick. The mental picture of success you have created helps train your body to execute the shot the way you want to.